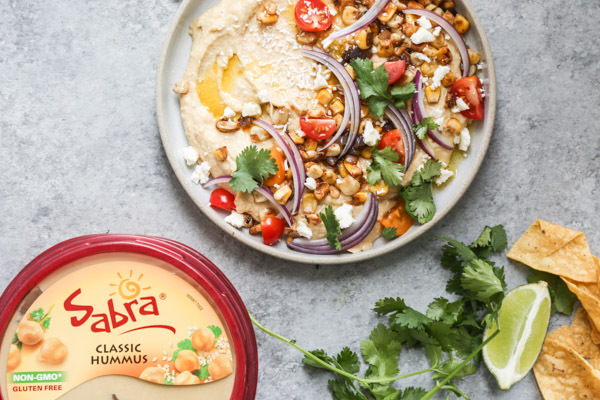 This spicy hummus recipe is brought to you in partnership with Sabra. I’m currently holed up at Charlie’s family home in Rhode Island. The weather outside is not frightful, but sufficiently gloomy. And the sheet of grey is calming after two weeks on the road, where the landscape abounded with new buildings to note, gluten-free treats to try and Hashi Posse members to hug. In some ways, I may have completely forgotten everything I learned while living and writing The Wellness Project when it came to planning the festivities around it. A big lesson was that it isn’t so much just gluten and dairy that clouds my system, but the hustle and bustle of too many days and nights on the town. Portland, Seattle and San Francisco were a total whirlwind of fun. It was amazing to see so many autoimmune peeps coming out for a dose of hope and humor. But maybe ill-conceived to pack so many cities and events into one week. From there, I flew from California to Providence for my 10 year college reunion. I danced, relived memories, and relished in the fact that my favorite late night falafel is, in fact, gluten-free. By the end of the weekend, the fog of human interaction had officially taken me down to infantile level brain and motor function. I could barely hold a conversation with Charlie’s mom, and was deeply in need of an emotional support animal to feed me arugula, give me calf massages, and grunt other orders at. I haven’t removed my grey flannel pants since, but I’m happy to report that the fog is lifting (even if mother nature hasn’t gotten the memo), and I’ll soon be fit enough for public consumption by tomorrow night. Just in time for my Boston launch party at Follain Beacon Hill! In the meantime, let’s talk about being healthy on the road, shall we? It may be a conundrum that you know intimately after last weekend. One of the questions I got often in my Q&A’s this past week was how do I manage to stick with my diet when hopping between planes, trains and automobiles? The answer is…I don’t. At least, not always. But the not-so secret secret, like anything health-related, is to always be prepared. I left my apartment in New York with a small shopping bag of snacks—the substantial kind that might be considered unofficial meals. Though I knew better than to pack hummus, thanks to previous TSA tussles, it was an item I often added to the mix once through security to nosh on with beet chips. Having these unofficial meals on my person at all times came in handy when I found myself, on more than one occasion, stranded in between meetings in the mid-afternoon with no time to track down an actual meal. I try to stake out places I want to eat in cities I don’t know that well in advance, so that I always have a Google map North star to guide me. But this trip being planned as psychotically as it was, didn’t leave me a whole lot of time for exploration. So I was grateful to at least have homemade Gingerbread Cookies Balls and a plant-based dip to stuff my face with. Though you’d think I’d be sick of both of those things by the time I made it to the eastern seaboard, I was still too emotionally and physically exhausted to make a go of completely homemade appetizers for the holiday. 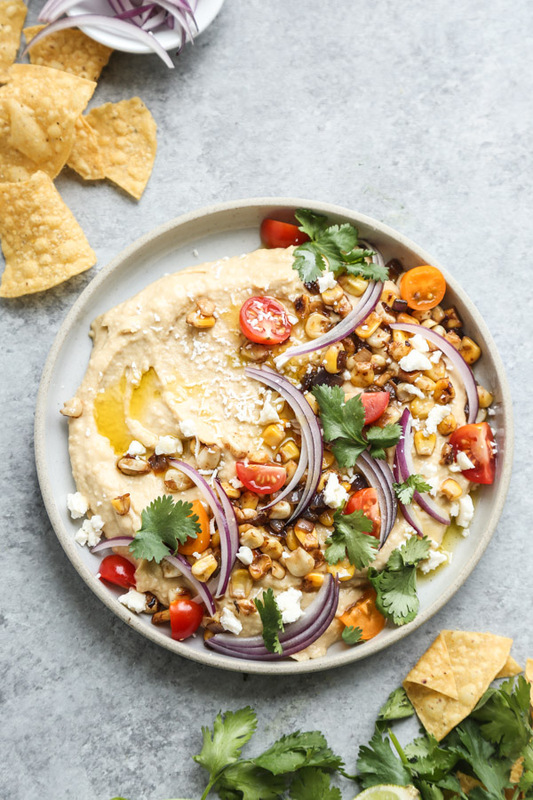 Instead, I tricked out my usual Sabra hummus with some southwestern seasonings: thinly sliced red onion, cherry tomatoes, queso fresco, and charred cumin-spiced corn kernels. 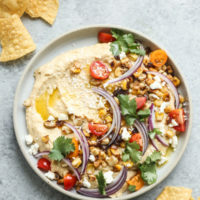 If you’re looking for a shortcut for company, or simply an unofficial meal to satisfy all manners of hunger that strikes in the afternoon, I highly recommend you give this semi-homemade spicy hummus recipe a try. It’s also a perfect picnic dish to take on the road in your brown snack bag, TSA- allowing. Cut the red onion in half. Thinly slice one half and set aside. Dice the remaining half. In a large skillet, heat the olive oil over medium heat. Add the diced onion and sauté until translucent, 5 minutes. Add the corn kernels, cumin and cayenne. Cook, stirring occasionally, until the corn is slightly caramelized, 3 more minutes. Season lightly with salt and set aside. 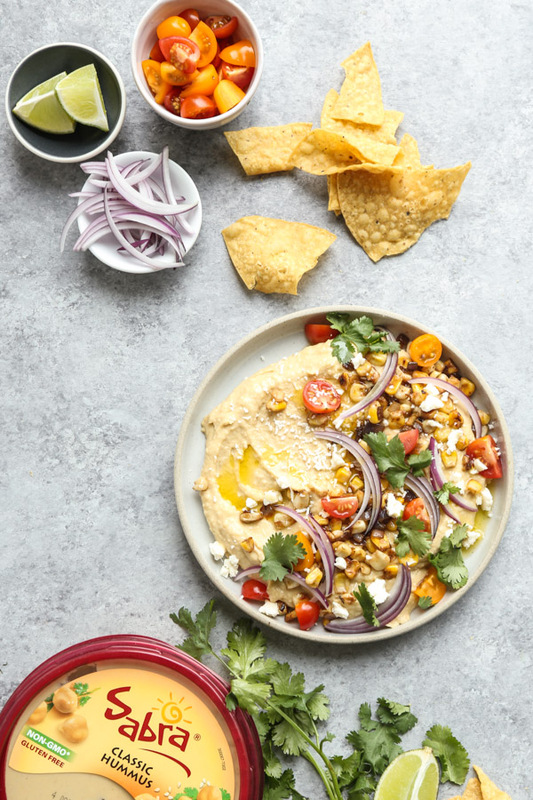 Transfer the hummus to a serving bowl or platter and scatter the corn mixture on top, followed by the tomatoes, and queso fresco. Season with salt, cayenne pepper, and a drizzle of olive oil. Garnish with cilantro leaves and serve with lime wedges. 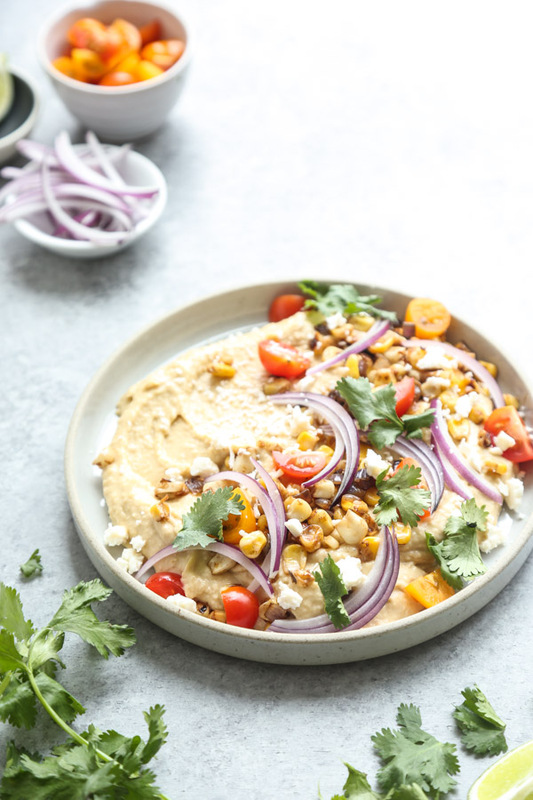 This spicy hummus recipe is brought to you in partnership with Sabra. All opinions are my own (duh). Thank you for supporting the brands that make this site (and my snack cravings) possible!